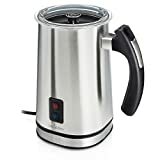 Severin 700ml Detachable jug, Induction heating technology, Adjustable temp settings with LED indicators, Lid opening to add ingredients, Hot / cold frothing Mid-Range VIEW PRICE HERE! Dualit 84145 Heated milk, Froth hot or cold milk, Included whisk Affordable VIEW PRICE HERE! Aeroccino 3 Duo whisk included, Light & creamy hot / cold milk froth High-End VIEW PRICE HERE! Jura Auto Milk Frother Cold, warm or hot milk foam, Simple one button operation Mid-Range VIEW PRICE HERE! Kenley Milk Frother Hot froth, cold froth and hot milk, Auto safety shut off Affordable VIEW PRICE HERE! When you are looking for the perfect coffee shop experience for your home, these milk frother machines might be just what you are looking for. They have all ability to recreate that lovely, silky froth that adorns your favourite cup of coffee and there is no need for any steam. Here is a list of the top five milk frother around at the moment. This milk frother from Severin (VIEW PRICE HERE!) is a beautiful looking product that has great design at its heart. It has useful features and is robust enough to keep you on frothy milk for a long time. Here are some of the reasons it got to number one. A detachable stainless steel milk container makes it easy to clean and easy to fill and empty. It is dishwasher safe so you won’t even have to wash it up afterwards. It can froth up to 700ml of milk, or just heat up to 500 ml. Handy if you need to just heat milk without frothing. The container and attachments are dishwasher safe and separate from the heating element for easy cleaning. It comes with two attachments, one for frothing and one for just stirring the milk while it is being heated. This is great for hot chocolate. The fact that it can be placed in the dishwasher is a great feature for this product. It is also versatile enough to heat a large amount of milk at one time. No wonder that it made its way to the top spot on our list. The Dualit milk frother is an elegant looking design that will look great next to the coffee maker. It has a nice stainless steel finish and smooth lines. Take a look at how it made it to number two. Can froth up to 200ml of milk or just heat up to 320ml for other drinks. It is quite a large capacity compared to others of this type. It also has a cold function that just froths without heating. This is perfect for milkshakes and other cold beverages. A patented dual motor design means it can do any frothy drink you need at the touch of a button. It has a removable whisk and non-stick coating for easy cleaning and storage. There should be no milk burning to the side and no need for harsh scouring pads. It can be lifted free from the base so that you can take it cord free to a table or another room. There are a number of nice features on the frother that will make lovely frothy milk for you and your guests. The variable speed motor will ensure that you always have the right speed and temperature for your drink. This is a high quality milk frother from Nespresso that is designed to heat and froth milk for the Nespresso coffee machines. But this is a standalone unit, so it can be used with any machine you want. Let us see how it made number three. It is a mains operated stand-alone unit that is a lovely design and well made. It will look lovely on any work surface. Double whisk included for frothing and stirring. You only have to select the appropriate amount of milk. It can froth up to 120 ml of hot milk or just heat 240 ml on its own. Ideal for many hot beverages, but can also whisk cold milk too. It is automatic so it will heat to the right temperature every time. All you need to do is touch the button and it will do the rest. This beautifully designed frother by Nespresso is a great product that will be a nice addition to any kitchen and make you lovely coffee. It is well built and durable so it should be able to make lovely hot milk for some time. This milk frother has a great design and comes in two parts for ease of use. The classic black and stainless steel look makes a great contrast and is easy to clean. Here are some other features of this frother. Can prepare hot or cold milk very quickly and easily. It can complete any heat level automatically and with a simple operation. The one-touch operation is very simple. It gives you an easy to read pictorial description of the current stage of the process. The magnetic drive means the milk container can be removed from the base unit. This makes it easy to clean and transport to the table. 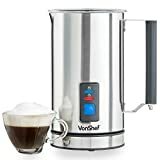 It can heat up to 0.34L or milk at a time which is perfect for one cup of coffee or another milky drink. The Jura Automatic Milk Frother is well made and has a non-stick coating for protection against burning. It is great for making your coffee extra special and giving you the choice of many hot milk beverages. Kenly have a reputation for making well made products and this milk frother is no exception. It has a great design and easy use that will be great for those frothy coffees. Let us look at some of its features. It can make hot or cold milk quickly and easily. Useful for cappuccinos or milkshakes, or whatever you desire. Can heat milk up to 65c in around 80 seconds so you don’t have to wait around for your hot milk. With three simple settings, it is easy to select the right temperature for you. There is hot froth, cold froth and hot milk to choose from. The stainless steel design and removable whisk makes cleaning a breeze and won’t leave burnt on residue. It has a maximum of 240ml capacity for just hot milk or 115ml for frothed milk. More than enough for a cup. The Kenly Electric Hot and Cold Milk Frother is a well-made product that will enhance any hot beverage or milkshake. It also has safety features built in to protect from overheating and burning. The top spot for milk frothers goes to the Severin 500ml Induction Milk Frother. It has a sleek design that can be separated for easy cleaning in the dishwasher. It also has a good capacity of 500 ml for hot milk which is more than enough for hot chocolate and malt drinks. For those that like their coffee to have that coffee shop look and taste even when they are at home, there are ways that it can be achieved. One way is to buy a milk frother that can create the light fluffy texture and taste you get in the shops. There are many types available but it is mostly about the different variations and heat levels. This guide will take you through the different features and specifications you can expect from milk frothers. The design of milk frothers can vary, but is mostly cosmetic. There can be a few things though that can be useful about the design. Some things can be integrated into the design to make it easier to use or clean. Stainless steel is a popular type of material used in frothers and other things of its type. It makes it easy to clean and rust free. Some products have a built in LCD display to show you what the setting is and also the stage your drink is currently at. Some however, will have just one button that will automatically choose the correct setting depending on the whisk and the amount of milk. There are products that have a removable milk container that is separate from the motor. This is very useful for cleaning and transporting the milk to a table. You can find cordless and corded versions, but the cordless ones are generally more convenient. The design is partly a personal choice, but there are other things that can be considered to make life a bit easier. This is one area that can vary a lot depending on the type of milk frother you buy. In general, it mainly depends on the size of the product and its capacity to deal with frothing milk as well as just heated milk. There are usually two levels for the milk, one for milk that is to be frothed and one for whisked milk. Because of the additional volume of frothed milk, it can usually has half the capacity of whisked milk. There are frothers with capacities of up to 500 ml, but the average is approximately 250ml. The capacity you need really depends on how much you think you will need. Normally you would only need approximately 210 to 250ml or milk for an average cup, but a larger capacity means you can do more than one coffee at a time. Although the temperature that the milk reaches is usually the same regardless of which product you choose, there can be variations depending on what the frother is designed to do. The heat of the milk is usually the same whether the milk is frothed or just whisked. Some makes of frother have a cold setting for milkshakes and other cold drinks. Although some do have variable heat settings, they are usually automatic and cut off when they reach the correct temperature. In most cases, the milk with be heated to approximately 65c. The time taken to reach this temperature depends on the product, but is usually around 80 seconds. The milk doesn’t reach boiling point so you have less of a problem with the milk burning to the container. You can also enjoy your drinks at the correct temperature for your coffee. The way the products froth the milk is achieved by whisks rather than steam as you would find in a coffee shop. The end result is the same however and there are two whisks that come with most of the products. There is a frothing whisk that beats air into the milk as it is being heated. This makes the milk expand and is the reason why the capacity is less than whisked milk. The other attachment is designed to stir the milk while heating. This is usually used for hot chocolate and regular flat white coffee. Some products have a blade type whisk that achieved the same purpose. The whisks are usually easy to remove and clean. Many products have storage compartments for them when not in use. There are many drinks that can be made using the combination of whisks. The controls on milk frothers are usually basic and easy to use, some of the higher end machines may have additional features. Most have a one button design that can be pressed once for hot milk or a longer press for cold milk. Some have a LCD display that can give you a guide to the setting and duration of your drink. In many cases, the button is rubberised so that it is impervious to water and can be cleaned with a cloth. The choice of milk frothers is quite vast and the specifications are often dependant on the make and quality of the item. There are a number of features that will be the same across the board, but it is worth considering all the factors before choosing. The biggest factor may be the capacity of the container, as this will affect the number of drinks you can make at one time. Whichever milk frother you choose, you will be able recreate that coffee shop taste and texture in your home whenever you want. You can even impress your friends with coffee shop style drinks.